Ebola! Israel and Palestine threaten to commit genocide against each other! Hurricanes! Earthquakes! Tornados! Wars in Iraq, Afghanistan, Russia, and Ukraine! Civil unrest in Ferguson, MO! Evil Liberals! Hateful Conservatives! Stories relating to these topics, or those like them, cross my Facebook news feed almost every day. Craziness is all over the news, and I have at least a couple friends that look at these things and see nothing but the end of the world rapidly approaching. These friends are also religious, so I get to hear about the good/bad news that Christ’s second coming is nigh at hand – bad because of all the excrement hitting the fan prior to his coming, but good because Christ will reign, evil will be bound, and humanity will get to enjoy a thousand years of peace before the foul smelling fan starts back up. I don’t pretend to know about the validity of such claims. I only have history to look at and my own brainpower to ponder my own attitude towards the craziness that humanity has put itself through for as long as it has existed. 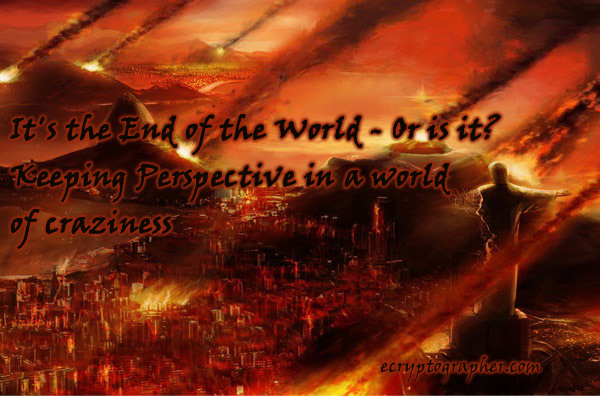 I make these general considerations when people want to start panicking about the end of the world. One of the first things I think about as I ponder the current state of humanity is the way that information is distributed. We receive our information from news sources that make money by getting you to their channel, site, or paper by making the news as sensational as possible. That’s how they earn their money. You also have to consider that every news outlet has an agenda – a worldview they want you to accept. In the case of an election year, you have to be particular aware of the timing of certain events and the way the news covers them. You might want to consider the fact that there are many other things that are just as important, if not more important, that the news is ignoring in order to cover the couple of Ebola cases in Texas. Unfortunately, the way they are sensationalizing these cases has people freaking out because somebody throws up on an airplane – people forget that airsickness isn’t that uncommon among those traversing the friendly skies. Ebola isn’t an airborne virus, but only spreads through contact with the bodily fluids of somebody else who has the disease. Ebola can be killed with soapy water and alcohol gel. It only survives a couple of days if left in ideal conditions like a pool of blood or spit in a cool, damp place. In other words, a little sanitation severely increases the chances that one will not contract the disease. I really think the whole Ebola scare is a tad overblown and is a distraction from other things that are much more important. It’s important to keep a proper perspective and remember the things we are fortunate to enjoy. Overall, I’d wager that most of the people I see getting caught up in the latest panic plots have enough food to eat. Those same people have a roof over their head. No doubt, they have people they love and that love them. We are as close together as a text message or a quick phone call to go out or invite over to enjoy some good food and company. Volcanoes have buried cities, hurricanes have brought wind and floods, storms rage in the skies and in the hearts of men as they have for millennia. They aren’t really becoming more frequent or more severe, but many think they are because of the way they’re portrayed in the news. Don’t buy the hype. Humanity has and will always have to deal with threats to its survival. We’ve been around as a species for a few hundred thousand years now. I’d say we’re generally good at dealing with what this world can throw at us when it doesn’t wipe us out. And even if it did, for a god fearing individual, that means you’ve moved on to something better anyway, right? So keep the right perspective and don’t panic. My money is placed on the fact that humanity will go on well beyond whatever years any of us that are alive today can possibly anticipate. But don’t forget to wash your hands before you eat something.